This type of pot-bellied drinking jug was common in Iran and Central Asia in the period 1400-1500. They were made in a wide variety of materials, including jade and precious metals. By the end of the century, they were also being made in Istanbul in silver gilt. Jug or tankard of silver, gilt, with bulb-shaped body and short neck, repoussé decoration with bands of interlacing floral ornament on a dotted ground; the handle in the form of a dragon. The body cast separately from the handle. The lid is a later addition. This is one of the earliest examples of a series of single handled jugs produced in Ottoman Turkey and based on an earlier Timurid shape. Ottoman jugs differ from the Timurid and Safavid examples in both material and technique. They all have a single handle in the shape of a dragon which was cast separately and soldered on. The decoration on this tankard was produced by repousse and the details of the motifs and the ring matting in the background by chasing and punching from the front. The neck bears a rumi braid; the body contains two densely composed superimposed scrolls containing cartouches, one with rumis and the other with hayatis; inside the foot ring is a multi-petaled blossom. The lid has a crenellated edge, is attached to the body by a chain and was added in the 17th century. The size of all of the jugs confirms their usage, large enough to contain a single serving. The shapes of these types of jugs are based on late-fifteenth century silver and/or gold-inlaid Timurid brasses, several of which are in the Istanbul museums. Most of these pieces must have arrived in the court after the conquest of Tabriz, either brought by Bedi uz-Zaman, the last Sultan of Herat, or taken as booty from the Safavids. The same shape was previously used on a jade vessel made for Ulugh Bey in the second quarter of the 15th century as well as on early 16th century Safavid objects. It is also found in zinc, rock-crystal, jade and other stone examples made in the Ottoman court as well as in contemporary ceramics. In addition it was copied in 15th and 16th century blue-and-white Chinese porcelain, persumably made for the Islamic courts. The fact that it was made in such diverse materials and techniques indicates that it was extremely functional. 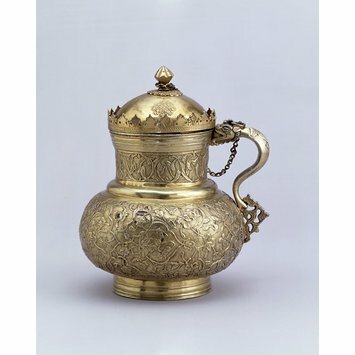 Silver-gilt drinking jug, Turkey (probably Istanbul), ca. 1500. Museum für Kunsthandwerk. Türkische Kunst und Kultur aus osmanischer Zeit. 2 vols. Frankfurt, 1985. 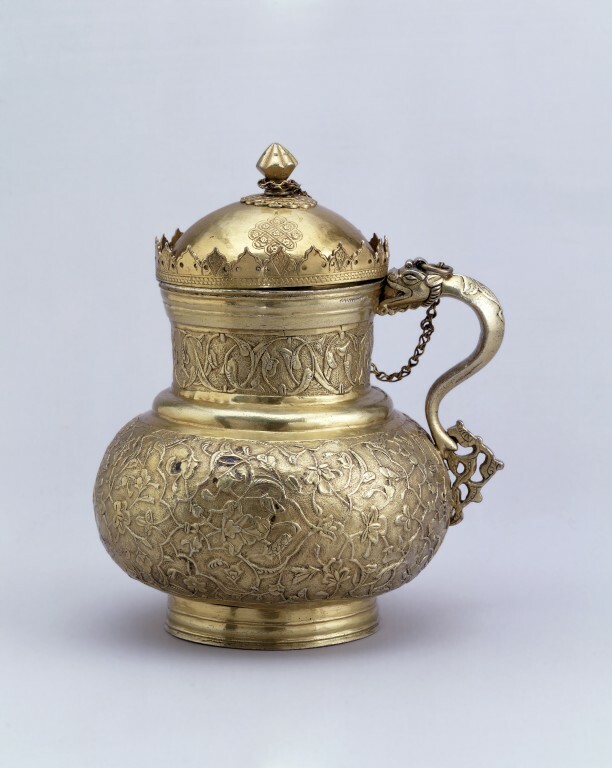 The pot-bellied drinking jug was common in Iran and Central Asia in the 15th century. It was made in a wide variety of materials. By the end of the century, examples were being made in silver gilt in Istanbul. Soon, though, denser decoration and shapes influenced by European metalwork were being produced, as the silver-gilt ewer nearby shows.